Prudential Financial, Inc. (NYSE: PRU), a financial services leader with more than $1 trillion of assets under management as of December 31, 2015, has operations in the United States, Asia, Europe, and Latin America. Prudential's diverse and talented employees are committed to helping individual and institutional customers grow and protect their wealth through a variety of products and services, including life insurance, annuities, retirement-related services, mutual funds, and investment management. In the U.S., Prudential's iconic Rock symbol has stood for strength, stability, expertise and innovation for more than a century. The Prudential Insurance Company of America (PICA) and Prudential Retirement Insurance and Annuity Company (PRIAC), both wholly owned subsidiaries of Prudential Financial, are leading the way in helping all types of defined benefit plans create a clear path to pension de-risking, regardless of their plan size or funded status. PICA's and PRIAC's risk transfer solutions combine its core strengths in retirement, insurance and asset management. In addition, PRIAC provides longevity reinsurance to insurers in the United Kingdom. These strategies transfer longevity risk to Prudential in exchange for reinsurance premiums, and deliver the flexibility U.K. insurers need, along with the added security their clients demand. For its innovative work in the $27 billion BT Pension Scheme transaction, and its continued support in this important growth area for the pension industry, Prudential has been named “Reinsurer of the Year” for the past two consecutive years. Reinsurance Group of America, Incorporated (RGA) is a global leader in the life reinsurance industry, with approximately $3.0 trillion of life reinsurance in force. From its world headquarters in St. Louis, Missouri, U.S.A. and operations in 27 countries, RGA provides clients with expert solutions in individual life reinsurance, group reinsurance, health reinsurance, facultative underwriting, product development and financially motivated reinsurance. After more than four decades of growth, RGA has become one of the world's most highly respected reinsurers, recognized for expertise in risk assessment and capital management, its ability to develop innovative solutions, and its unwavering commitment to its clients. Hannover Re, with gross premium of around EUR 17 billion, is the third-largest reinsurer in the world. It transacts all lines of property & casualty and life & health reinsurance and is present on all continents with around 2,500 staff. 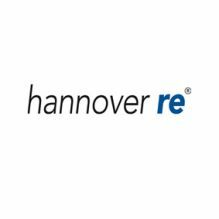 Established in 1966, the Hannover Re Group today has a network of more than 100 subsidiaries, branches and representative offices worldwide. The rating agencies most relevant to the insurance industry have awarded Hannover Re very strong insurer financial strength ratings (Standard & Poor's AA- "Very Strong" and A.M. Best A+ "Superior"). In 2016 Hannover Re celebrates its fiftieth anniversary. Hannover Re has a long tradition as the market-leading reinsurer in the UK longevity market. We entered the market in 1995 with the launch of enhanced annuities. In 2006 we leveraged the experience we gained to enter the pensions market in the UK. Meanwhile, we have expertise in both the enhanced annuity and the pensions market on a worldwide basis. The competence center for longevity within Hannover Re is based in Hannover, where we have a strong team of actuaries with extensive experience in the longevity business. Hannover Re cooperates closely with its local entities; therefore we are in the unique position to provide our clients with access to an international knowledge base. With the rapid expansion of the pension market we have concluded transactions (in terms of net present value of liabilities) in the order of EUR 21 billion in the European pensions market and EUR 8 billion in the UK enhanced annuity market. We look forward to supporting our clients with individual reinsurance solutions tailored to their specific needs drawing on global experience and capacity. Milliman is among the world’s largest independent actuarial and consulting firms, delivering market-leading services and solutions for clients for over 60 years. Working locally as part of a global team, our professionals help clients to fulfil their potential, whether it involves reimagining actuarial reporting, implementing cutting edge risk management, delivering product innovations, or efficiently structuring their businesses. milliman.com. Oliver Wyman is a global leader in management consulting. With offices in 50+ cities across 26 countries, Oliver Wyman combines deep industry knowledge with specialized expertise in strategy, operations, risk management, and organization transformation. The firm's 3,700 professionals help clients optimize their business, improve their operations and risk profile, and accelerate their organizational performance to seize the most attractive opportunities. Oliver Wyman is a wholly owned subsidiary of Marsh & McLennan Companies [NYSE: MMC]. For more information, visit www.oliverwyman.com. SCOR Global Life. A top-five global reinsurer, SCOR recorded premium income in excess of EUR 11 billion in 2014 and managed total assets of more than EUR 37 billion. The Group has a balanced business model with three branches: SCOR Global Life (life reinsurance), SCOR Global P&C (non-life reinsurance, combining reinsurance with direct and facultative P&C business) and SCOR Global Investments (asset management). The SCOR group is committed to working with its clients on a long-term basis, providing them with high added value, innovative and tailor-made reinsurance solutions. The Group has a worldwide presence through its 39 offices spread across five continents. Willkie Farr & Gallagher LLP is a leading international law firm with approximately 650 lawyers based in key financial centers: New York, Washington, Houston, Paris, London, Frankfurt, Brussels, Milan and Rome. Our clients include domestic and international insurance and reinsurance companies, insurance brokers, private equity firms, hedge funds, and other insurance industry investors. Our Insurance Transactional and Regulatory Practice is an interdisciplinary team of lawyers devoted to the full spectrum of insurance-related transactions, including mergers and acquisitions, public and private securities transactions, institutional private placements, financings and joint ventures as well as specialized insurance and reinsurance structures such as securitizations, collateralized reinsurers and sidecar transactions, hybrids, catastrophe bonds, dedicated insurance-linked securities funds and contingent capital facilities.